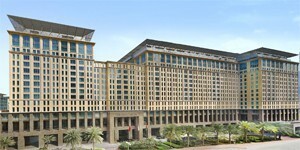 Grosvenor House, A JW Marriott Hotel raises the bar for luxury accommodation. Perfectly placed on world-famous Park Lane, our historic hotel allows for unparalleled access to a range of destinations in London's vibrant Mayfair district, while our newly renovated guest suites and 5-star amenities will ensure that you have everything you need for a one-of-a-kind experience. Satisfy your cravings here in Mayfair, London at our top-quality on-site restaurant options, break a sweat in our well-stocked fitness centre or enjoy the Park Room's renowned afternoon tea experience.